Penelope Rutledge longs for passion, but only with the man of her dreams: the brilliant, dashing Ethan Weatherstone. If only her longtime neighbor would open his eyes and realize how much she loves him. If only they weren’t best friends with so much at stake. Penelope knows her future—and their friendship—is in her hands, but is she willing to take the biggest risk of all on the man she loves? If it were up to Ethan, life and love would be as predictable as the figures in his ledgers—certainly nothing like the adventures Penelope longs for. Yet his childhood friend has grown into a beautiful, feisty woman blissfully unaware of the danger she causes when near. Ethan knows he must save Penelope and her reputation … but can he save himself from the temptation of her lips? 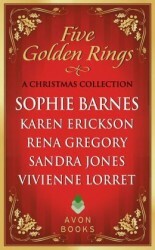 This novella previously appeared in the e-book anthology Five Golden Rings. Penelope threw open the door and climbed inside, seething as she sat across from him. He didn’t even have the courtesy to look at her. Instead, he sat back against the squabs, his head turned to the window. The only reason she knew he was aware of her presence was from the way he clenched his jaw, a muscle twitching just beneath the surface of his skin. He refused to respond or even so much as look at her. If she hadn’t been angry before she entered the carriage, then she certainly was fuming now. At that, he glared at her sharply. Ah, so she’d struck a chord. Good. Yet still, he did not say anything. There he sat, perfectly groomed, his cravat perfectly pleated, his temper perfectly managed. She wished just once he’d lose some of that control. Because here she sat, with her eyes, most likely puffy and red from having cried most of the night instead of sleeping. She was certainly not perfectly groomed since she could feel a soggy tendril of hair plastered to her cheek. Her cloak was damp from rain. Her nose was cold and likely red as well. She glared at the offending garment, struck by a ridiculous notion to crumple it. No sooner had the idea formed that she gave in to the impulse and moved forward on her seat, her arm reaching forward. Ethan stopped her, taking hold of her wrist. His eyes flared. Before she could react, he yanked, propelling her forward to land clumsily on his lap. His mouth covered hers, silencing her outrage.